When I was nineteen-years-old, a few months after my mom married my step-dad, we took our first vacation as a blended family – my mom, brother and me, together with my step-dad, step-sister, and step-brother. My uncle, aunt and cousin went too. So that would be nine of us, just in case you are mathematically challenged. We rented a houseboat on the Delta in Sacramento and took my uncle’s speedboat as well. This is not us. But it could be. I was grumpy because I had to leave my boyfriend, Scott, for a week. This was 30 years ago (yes, I really am that old, shut up), before cellphones and texting and Skype, so being on a houseboat for a week meant no communication. And if you were once an overly dramatic nineteen-year-old (aren’t all nineteen-year-olds overly dramatic?) who had to suffer the terrible awful horrible fate of being separated from your boyfriend or girlfriend for a whole entire week, then you certainly know how mean and unreasonable it was for my family to expect me to suffer this vacation with them. I can only imagine what a joy I was to be around. I’m sure I let myself have some fun. I did (after many summers of trying) learn to water ski on that trip. (The trick was one ski instead of two and push that back foot down hard, hard, hard.) And I got pretty tan. Other than that I don’t remember much about the trip. 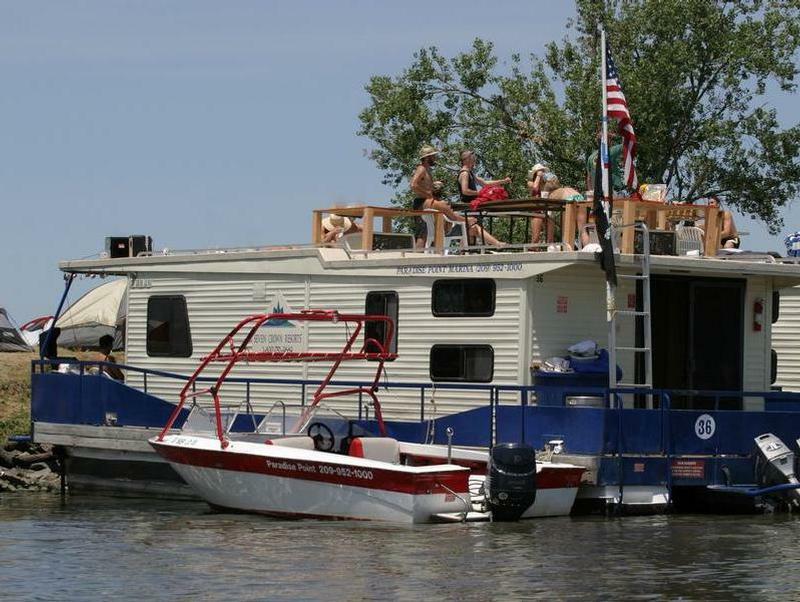 No one had ever driven a houseboat before. (Do you drive a boat? What is that called exactly? It doesn’t have sails, so I know you don’t sail it. Wait. Where was I? Oh yeah…) Coming in and out of docks could be a bit challenging, to say the least. The adults would get stressed out and bicker about not hitting other boats (or people) so I would always go lie on my bed and take a nap or go to the top deck and sunbathe to avoid the arguing. I reluctantly told Scott that I’d better get back to the boat before I got in trouble and went down to the dock where I saw our two boats. Except instead of being tied to the dock waiting patiently for me they were driving (sailing?) away. I stood at the end of the dock and waved my arms and yelled, but they were too far. I guess I was talking to Scott a little longer than I thought. Whenever we left a dock the adults were always concerned about where the little kids were, but since I always retreated to my bed or the roof to sunbathe, they just assumed I was retreating. Apparently it didn’t take my mom long to figure out I wasn’t there (relatively speaking). She walkie-talkied the speedboat to see if I was on it and when she found out I wasn’t freaked out a bit. She wanted to turn the boat around immediately to go get me, but my uncle thought it would be best to dock the houseboat for the night (if you didn’t dock it early enough you wouldn’t get a good spot) and then go back for me with the speedboat. I did the only logical thing – went right back into the bar and called Scott again and talked until they came to pick me up a few hours later. Well, that might be a bit over-dramatic. It was probably only one hour. And fortunately it wasn’t overnight. *This blog post is especially for my Uncle John (as this is, by far, his favorite story), who reads all my posts and complains that they are too girly and that he has to go do “man stuff” after reading them. you were even a very naughty girl then, too! Is it weird that I now want to stalk your Facebook friends list to see a Scott? Ha! Every single 19-year-old girl is not only overly-dramatic, but also convinced she’s going to marry the boy/man she’s dating at the time. Thankfully, you and I have matured SO MUCH since then. Man, we miss out on so much drama now that we have cell phones. Long live the walkie talkie.